Vietnamese shares posted a strong comeback on February 12 after a two-day collapse, due to strong investor interest in large-cap stocks that led the market upturn on expectations of good earnings reports. The benchmark VN-Index on the HCM Stock Exchange (HOSE) gained 3.77 percent to close at 1,041.79 points. It was down 1.89 percent to close at 1,003.94 points on February 9. 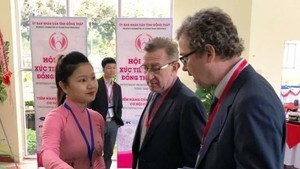 The HNX Index on the Hanoi Stock Exchange (HNX) rose 3.85 percent to end at 100.02 points. It edged up 0.48 percent to end at 117.50 points on February 9. The UPCOM Index on the Unlisted Public Company Market (UPCoM) jumped 1.70 percent to finish at 57.45 points. The index jumped 3.30 percent to finish at 56.76 points. 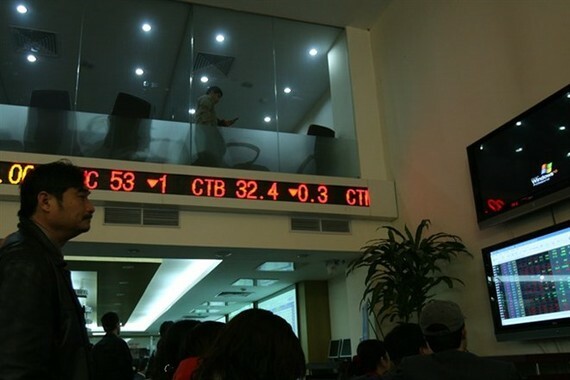 More than 221.8 million shares were traded on the three local exchanges, worth 5.87 trillion VND (258 million USD). Financial-banking and oil stocks were the best-performing among the 20 sectors on the stock market with the banking, brokerage and energy industry indices jumping 5.65 percent, 4.16 percent and 6.23 percent, respectively, data on vietstock.vn showed. Market trading conditions turned positive on February 12, with 469 gaining stocks against 155 decliners, while 297 other stocks remained unchanged. Large-cap stocks also had a good trading day as 26 of the 30 largest shares by market capitalisation advanced in the VN30 Index. The VN30 Index was up 2.81 percent to 1,034.76 points with more than 60 million shares exchanged, worth 3.03 trillion VND. Blue chip stocks were strongly bought and pulled the VN-Index as well as the VN30 up especially in the ATC session. Banking (BID, CTG, and MBB reached the ceiling price) and petroleum (PVS, GAS, PVD reached the ceiling price) were the largest contributing sectors. In addition, securities, steel, real estate and aviation sectors also showed positive aspects with green colour dominating these stocks. Foreign investors were net sellers with 450.67 billion VND on HOSE, focusing on HPG (228.03 billion VND), VRE (103.00 billion VND), and VNM (60.44 billion VND). In addition, they sold a net of 9.44 billion VND on the HNX. According to BIDV Securities Co (BSC), after the recent sharp correction, stock prices were quite reasonable for investors. “Moreover, the rumour that adjusting the margin rate will be postponed helped demand become stronger,” BSC said in its daily report. “It is likely that in tomorrow’s session, cash flow will continue to shift into the market and financial sectors such as banking and securities are quite attractive,” it added. Meanwhile, Bao Viet Securities Company (BVSC) said in its report that after the rally on February 12, the market may become balanced in the last session before the Tet holiday. “The divergence and low liquidity may be seen on the market on February 13,” it said.